Aaah... its the weekend again and what makes this even better for me is that I don't have any entertaining plans whatsoever! With the new year, I made it a point to have one full weekend for myself without entertaining. I definitely need some 'me' time and this weekend is it! to start off the day, I wanted something I could put some effort into for breakfast. The past week my breakfasts have consisted of toasted english muffins, yogurt, cereal, etc... all grab and go type meals. But today I'm treating myself to some of these pancakes. Thanks to Kira, she inspired me to make these and it's a delicious way to start the morning! I tracked down the original recipe from MyRecipes.com and the only adaptation I made from the original was using whole wheat flour in place of regular all purpose flour. It offered a nice nutty flavor to the pancakes. Lightly spoon flour into a dry measuring cup; level with a knife. Combine flour and next 4 ingredients (flour through salt) in a large bowl, and make a well in center of mixture. Combine buttermilk, oil, and egg; add to flour mixture, stirring until smooth. Spoon about 1/4 cup batter onto a hot nonstick griddle or nonstick skillet coated with cooking spray. Turn pancakes when tops are covered with bubbles and edges look cooked. those pancakes look like the perfect intro to a weekend breakfast! Those look so big and fluffy! I bet they were delish! These look lovely! Too bad my SO hates blueberries. I put them in a salad last night and he picked them ALL out. I'm with you on the needed "me" time. Great way to kick off a weekend of relaxation! I'm going through such a blueberry phase right now! I had eggs and blueberries for breakfast this morning, but this looks way better. These look so fluffy and delicious! 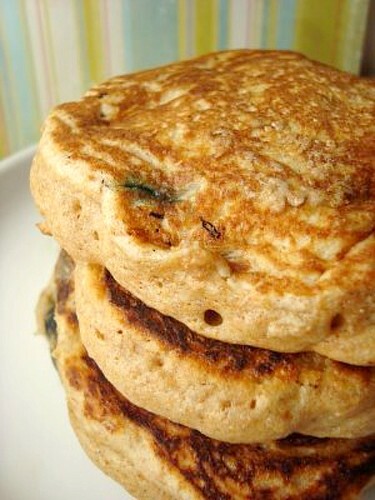 I have some blueberries in the fridge so these might make an appearance tomorrow morning in my kitchen!